Maryland-based Enviva LP broke ground on a new 500,000 ton-per-year pellet production facility in Southampton County, Va. The plant represents the biggest economic development opportunity in the county over the past 20 years. The 6th Annual Algae Biomass Summit, taking place in Denver, Colo. September 24-27 will showcase more than 30 presentations in its Biology Track from researchers and scientists at leading companies, universities and national labs. The USDA announced payments to 125 biofuel producers on July 27, including several biogas and pellet companies. 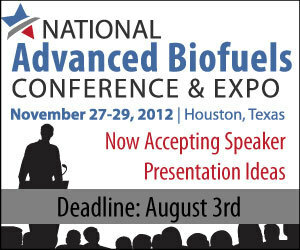 The awards were made under the Bioenergy Program for Advanced Biofuels, which was established in the 2008 Farm Bill. In an effort to reduce overall heating costs for its larger Alaskan facilities, the U.S. Coast Guard is making efforts to convert from heating oil to wood pellets and is collaborating with the USDA's Forest Service to further progress. Cereplast Inc., a leading manufacturer of proprietary biobased, sustainable bioplastics, recently announced that the U.S. Patent and Trademark Office has granted patent protection for high heat resistant polymer compositions having polylactic acid. EurObserv'ER has released its annual Biofuels Barometer report, showing that growth in biofuel consumption in the 27 EU member states decreased in 2011. However, consumption of second-generation biofuels is expected to increase in the future. The Pew Project on National Security, Energy and Climate recently released a letter signed by 350 veterans urging support for biofuels, while the Secretary of the Navy Ray Mabus has debunked biofuel misconceptions via his Facebook page. Loretta Daniel, the director for regional business and the innovation center at Murray State University in Kentucky, recently provided an update on the West Kentucky AgBioworks Initaitve to local and federal authorities. Power utility Xcel Energy's Southwest Public Service Company is seeking to add more biomass power to its renewable portfolio, and has released a solicitation for 88,705 megawatt-hours, preferably located in New Mexico. Rochester, N.Y.-based Sweetwater Energy Inc., a cellulosic sugar manufacturer has oversubscribed and closed its Series A funding round. The company sought $5 million in initial funding, but investor response was greater than expected. Algae.Tec held a grand opening for its algae-to-biofuel plant in New South Wales, Australia, on Aug 2., a facility that the company said is the first of its kind in the country. Doyon Utilities LLC held a ribbon-cutting ceremony today to celebrate the opening of the first landfill-gas-to-energy project in Alaska, which is powered by GE's ecomagination-qualified Jenbacher gas engines. The Canadian Northern Economic Development Agency and the Northwest Territories government have invested over $5.7 million to create opportunities for a sustainable woody biomass industry in Canada's Northwest Territories.